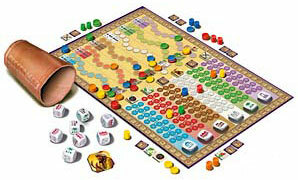 Compete with the other players in this smart game of dice to construct the legendary Alkhambra. Employ your dice skilfully and finally emerge as the best master builder in this game. The remarkable thing about this game is: Although it is a game in its own right it can also be combined exceptionally well with the base game Alhambra. Delight at the new Alhambra game excitement. So I played this the other night at a local Game Night and I wasn’t that impressed. It’s a pretty good dice game, on that I’d probably like to play again, but with the Base Game rules that we were playing it’s kind of just… a dice game with very little “Alhambra” to speak of in game play. Also: We had 3 players and the game took almost 2 hours. Which seems ridiculous. The play time on the box says “60 Minutes” and it’s a 3-6 player game, so we were working with the lowest number of players. So, what is the game? And what is with that previous sentence? That’s not how sentences work! On your turn you get three chances to roll the 9 dice. You can stop rolling at any time, or you can push your luck. You’re trying to roll matching symbols that match columns on the board. If you can get the highest score on a column you get “Building Points” as a reward and a chance to earn Victory Points during the Scoring Phases that take place after Rounds 1, 3 and 5. The “Columns” that you can place in have three spots for each number, depending on when you successfully roll that number. So if you roll it on the first attempt you get the Far Left and if you get it on the third roll you get the Far Right. If people tie, the person who got there in the fewest rolls gets the better reward. If you roll 4 Red on your Third Roll and someone else has already placed on that color for that many dice rolls you get bumped down to the next available space(3 Red, 1 Roll in this case(if it were empty). This happens regardless of when you rolled those dice, so if you roll First Roll: 2 Red, Second Roll: 2 Red, Third Roll: 0 Red you still get the 4 Red, 3rd Roll space. Sometimes it’s worth taking the risk, but in our experience we found that it was better to just stop when you were ahead. Depending on the number of players you’ll place up to 5 tokens(fewer are placed with more players. But like I said we had 3 players, so we placed all 5 each turn) to indicate what you’re going for during the “Rolling Phase”(we’ll call it). After everyone has placed their tokens you give out the rewards. First Place gets to choose either Two Building Points or One Building Point and the Bonus Token. Second Place gets what First Place didn’t choose. Bonus Tokens can be Immediate Victory Points or Special Power tiles, like being able to use an extra die which always shows the face of your choice, or being First Player. There’s a bunch of powers, and they don’t all seem amazing. But this is off of a single play and I’m bad at games. After awarding the Building Points if it’s a Scoring Round you give out Victory Points. These increase in the same way they do in normal Alhambra. And you do that until there’s been 5 rounds. It’s a decent game. I liked the “Push Your Luck” element of it and I liked the way that even a relatively bad roll can get you a fairly good place on the board. But: When I play an Alhambra game I want to play something with the tiles and with the strategy of placing those tiles being very important. This has the scoring of Alhambra, but that’s about it. There are rules for how to set up the game to play with the tiles. But we didn’t have the base game with us, so we just played the “Dice Game” rules. It’s a pretty good dice game, but it took WAY TOO LONG for what it was. Maybe it’s because we were talking while playing. Maybe it was because we were playing for the first time, but it was a two hour dice game that did not offer you things to do when it’s not your turn. It’s still a 6/10 though. I’d really like to get a chance to try the rules where you use the row to collect and place tiles. Add a Review for "Alhambra: The Dice Game"